Divise in V. Parti et di nuovo con somma accuratezza ristampate al santissimo et beatissimo Padre Signore Nostro Clemente VII. 5 parts in 1 vol., 8vo., text in Italian, with fine engraved woodcut portrait of the author on title; contemporary full vellum, backstrip lettered and dated in MS with Sinclair family stamp in gilt, yapped fore-edges, blue sprinkled edges, some light and largely uniform age-stoning else a remarkably bright, clean, crisp copy. A SINCLAIR FAMILY COPY OF THE 'TESTINA' MACHIAVELLI, WITH FINE NINETEENTH CENTURY ENGRAVED ARMORIAL FAMILY BOOKPLATE ON FRONT PASTE-DOWN, MS SIGNATURE 'SINCLAIR' ON TITLE, AND FAMILY CREST WITH MOTTO STAMPED IN GILT ON BACKSTRIP. The bookplate carries the Sinclair press-mark in MS and the front paste-down several (cancelled) earlier press-marks. With a nineteenth century bookseller's printed cataloguing mounted facing front free endpaper. The collection comprises: Part I: Historie Fiorentine; Part II: Il Principe. La vita di Castruccio Castracani. Il modo che tenne il Duca Valentino per ammazzare Vitellozzo Vitelli. I ritratti delle cose di Francia e di Alamagna; Part III: Discorsi sopra la prima Deca di Tito Livio; Part IV: Dell'arte della Guerra; Part V: L'Asino d'oro. With the Index and Privilege of Clemente VII. 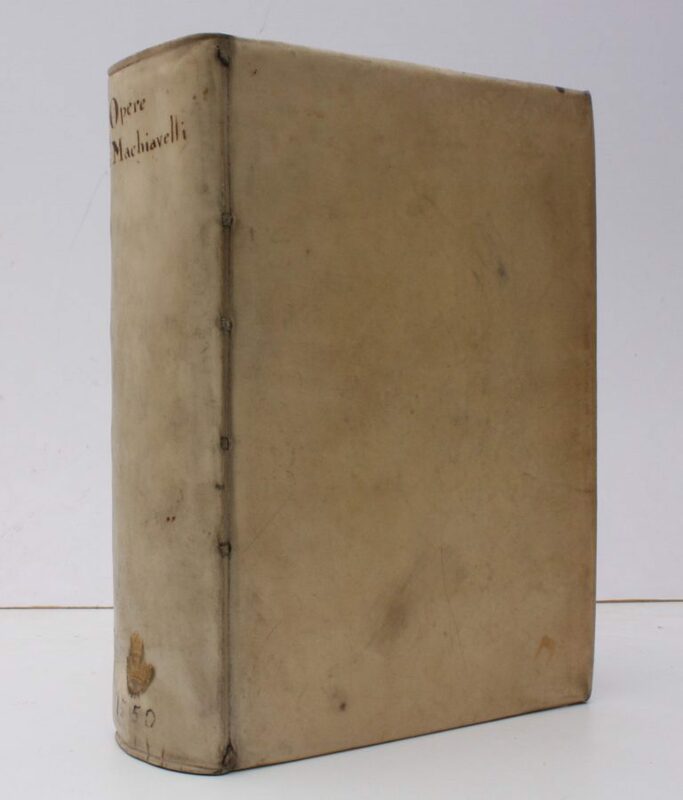 The dating is false; several editions of Machiavelli carry nominally earlier dates following their proscription by the Pope in the 1550s. General James St. Clair-Erskine, 2nd Earl of Rosslyn (1762-1837) was educated at Edinburgh High School and Eton, and commissioned in 21st Light Dragoons (one of the several early manifestations of the regiment; disbanded 1783) after which he pursued a distinguished military and political career. He succeeded his uncle to the Earldom in 1805, and was in the following year a member of the Mission to Lisbon which resulted in Wellington's Peninsular Campaign. He was appointed General in 1814, Lord Privy Seal (1829-30) and Lord President of the Council under Peel (1934-5). The Geneva 'testina' editions take their name from the 'little head' of the author carried on titles. Brunet, III, 1274; Gamba 623 (recording several variant printings).